The farmer has to care about subjects like the availability of substrates for biogas use and the options for transport and storage, first settings on plant type and on categories of production capacity on the options for energy use so as information on plant location and implementation into the existing farm. The project idea begins with the questions e.g., if a biogas plant will fit into the agricultural business, will the project be helpful to enhance the farm in its development and what information’s are needed to answer these questions and to develop a precise project idea. This first step of the project embraces all the basic questions the farmer should have during his first reflection to decide, if he wants to go on planning a biogas project. As it is the first step of action, mainly general data collection, qualitative assessments and rough quantitative calculations can be done by the farmer itself. When considering a biogas project, it is important to see the whole picture, including the availability of substrate, the actual biogas plant and the supply of energy to purchasers. The three aspects presented in Figure 2 must be considered from the outset in the same degree of detail, the objective being to carry out a well-founded initial evaluation of the project concept. At the end of the first step “project idea”, the farmer will have a clearer idea of his project thanks to first qualitative and rough quantitative calculations regarding the substrate provision, the plant capacity and the produced energy. The farmer will decide to stop the project or to go on and specify his project idea in more detail. The following aspects for the first project overview will be described in more detail. The report provides a checklist on the main aspects introduced below. The online calculation tool will be helpful by developing the project idea. The farmer has to specify and pre-estimate the substrates available on his farm for running a biogas plant. This starts from the different kinds of feedstock / substrate available on the farm and also when the substrates will be available during the year (continuous, seasonal, once a year) in long term. But this only counts for fermentable substrates. Biomasses with high cellulose content or “bulky” substrates like horse dung with straw may need a pre-treatment before use. Woody biomasses are not suitable for anaerobic digestion. Additionally, the substrate provision from nearby farmers or industries should be considered. Which kind of self-produced substrates (e.g. livestock manure or dung, clover-grass, energy crops and/or residues from agricultural production like potato peelings) are available in the long term? Do I have medium-term/long-term plans to change my farm? Will the farm-produced substrate be enough in long term for running a biogas plant? Will there be some suppliers nearby who can provide substrates regularly, in long term and to which costs? Is the use of these substrates worthwhile in view of the statutory requirements (question of proportionality, e.g. by using hygienic risky wastes)? Are the substrates suitable for the anaerobic digestion? Do I might need a pre-treatment for some biomasses? How much tonnes will be available ever year and when? Which pre-estimated qualities will the biomasses have (biogas yield per tonne)? How is the surrounding infrastructure – will the farmer and/or supplier will be able to transport the substrates easily and cheap to the plant? The substrate potential of the farm and the resulting biogas potential are decisive for the dimensioning and design of the biogas plant and producing energy quantity. Based on the pre-estimated substrate data the plants type, the category of the plant size and the plant capacity can firstly be estimated. Plant technology for biogas recovery covers a very wide spectrum. There are virtually no limits in terms of component and equipment combinations. It must be noted, however, that expert analysis of plant and system suitability and capacity adaptation on a case-to-case basis are invariably required. There are several variant processes for generating biogas and many different concepts for small-scale anaerobic digestion on the market [KTBL 2013]. process temperature (mesophilic or thermophilic operation). The plant size results significantly from the farm-produced substrate mix and its specific gas and methane yield, from which the producible biogas quantity can roughly be determined. Based on standard biogas yield values for each type of biomass used, the possible annual biogas-and methane yield can be estimated. This can be used for the dimensioning of the biogas plant and to estimate the producible energy amount. The capacity of the plant can be indicated in produced electricity (kWhel), produced heat (kWhth) or produced (raw)biogas or biomethane (m³/h). With the online calculation tool, the first assessment on biogas production and size of the biogas plant can be checked. The information on the plant size will also contribute to think about the adequate and acceptable location for the biogas plant and to about the question how will operate the plant. Based on the gas formation potential of the annual substrate for the plant, the expected amount of energy can be roughly estimated. The farmer should think about how he will use the produced energy. Depending on the conversion-process (CHP, boiler or biomethane production) different types of energy or products will be produced. 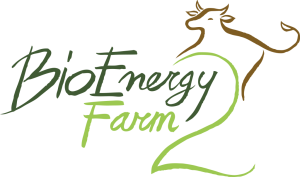 For biogas typically electricity and heat will be produced in a combined heat and power plant (CHP) on the farm. The electricity can be fed into the electricity grid or used to reduce the electrical purchase of the business. The produced heat is firstly needed to hold the process temperature of the plants. Depending on the plant size, the substrate mixture (high manure content has a high heating demand) and weather conditions, a varying amount of surplus can be used on the farm for heating and warm water production. It also might be possible to deliver external heat customers (e.g. greenhouses, pig farms, neighbouring houses and enterprises). Biogas can also be used in a boiler for heat production only or, as an alternative option to CHP, be upgraded to biomethane (natural gas quality level) and fed into the national gas grid to be delivered to the customers directly. In addition, the fermentation produces digestate as a by-product that can be used as fertilizer and therefore partially replace mineral fertilizer. destruction or inactivation of weed seeds and pathogens (human-, zoological and phytopathogenic). Since the carbon fraction is changed by the fermentation of substrates, in essence the nutrients remain unchanged. The nutrients in the digestate are more soluble and therefore more available to plants after the anaerobic digestion process [KTBL 1999]. In addition, the digestate also carries a certain value, which can be calculated on the basis of current fertilizer prices. The value of 1 m³ manure digestate is (country specific) about 10 € per ton. Related to the value is also the transportability. At a distance of more than approx. 18 km the transport costs for digestate exceed the price for mineral fertilisers [Eder 2012] and transport is no longer feasible in economic terms. Which form(s) of energy do I want to produce (electricity/ heat, heat or gas)? Is the energy production only for farm-based (own) consumption? Who will buy the energy? Are there potential heat purchasers close to my farm? Do I have to invest in a local destitution network? How much heat needs to be supplied every month? Will there be enough surplus heat from a small-scale biogas plant, to ensure constant delivery to external heat customers? How much digestate will I produce? What opportunities of post-fermentation waste management are available? Will the post-fermentation waste management be an additional cost or income position? Based on the rough estimation of the annual biogas yield from the available biomass and the resulting plant sizes, a first assessment of the necessary investment for the biogas plant can be done. In addition, first predications on the potential benefits and revenues can be made. The online biogas calculations tool gives the farmer the opportunity to get a general overview on the expected plant size resulting on the on farm situation and a first idea of possible costs and benefits of the biogas project. The question of the legal form for the construction and operation of a biogas plant must be clarified early in advance of the project. The choice of the legal form is not just a question of tax burden, but there is a significant interaction between national corporation and fiscal law, cause the taxation law has normally different consequences depending on the legal form. In many countries, individual enterprises are very common in agriculture. With the inclusion of an agricultural activity, either through the establishment of a company or from the transfer of a business, the owner becomes an individual enterprise who scores income for tax purposes. The advantages of a legal form for the establishment or acquisition of a biogas plant often depends on the size of the biogas plant and the way in raising capital. For small scale biogas plants it may be preferable in some countries, to operate them as a side business to the farm. Thus, the legal form of the farm business is also critical for the companion business. The legal form can be individual enterprise or a business partnership, like a partnership organised under the civil code [FNR 2013, FNR 2013 b]. Biogas plants which will be run as a separate business, beside the initially farm business, might have a limited partnership or possibly a private limited company as legal forms. Differences between the individual legal forms are, for example, the liability, allocation of profits, publication requirements, capital raising and administration of a business [FNR 2013, FNR 2013 b]. The farmer should think in parallel about the nature/structure he’d like to give to his enterprise. 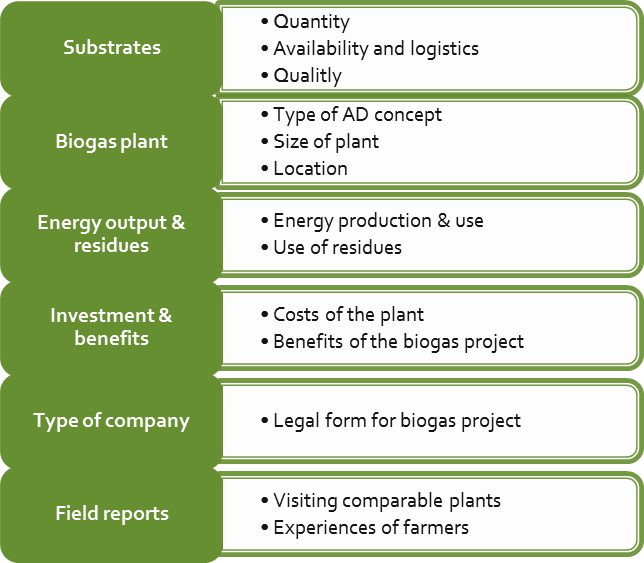 An overview of the most relevant legal forms of company for biogas projects with characterization and description can be found in Annex 2 of the handbook (chapter 1.1). In addition to the technical aspects of the biogas project, the fiscal aspect has to be kept in mind. This applies for example income tax, business tax or sales tax. Tax law related issues are not covered in this handbook, but they should be discussed in each case with a tax consultant or the taxation authorities. assessment of the needed project run-time from planning till energy production. Micro scale digestion is, with some exceptions, a continuous process based on liquid manure. The basis of the biogas installation is the digester, which mostly consists of one or more gas tide manure storage tanks. The produced biogas in de digester can then be utilized to provide a sustainable fuel on the farm, for example to produce heat, electricity or biomethane. This energy can then be used on the farm, delivered to a nearby heat user, or fed into the grid. 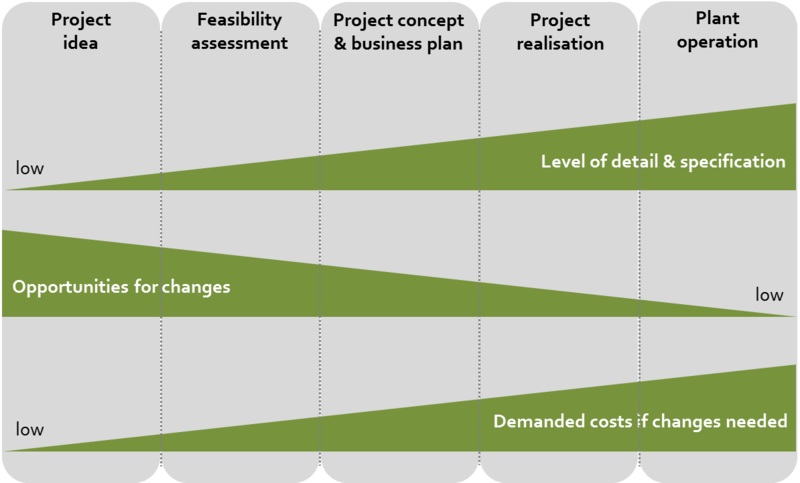 Changing the project plan can cost a lot of money! It is necessary to make project changes at the beginning of the project (as soon as possible) to have bigger positive influences in comparison to make them later in an advanced stage of the project (see Figure). Another advantage of doing this early is that costs and time are less than in advanced staged projects. For a successful and expected course of project this means, the sooner you act in an early project stage against wrong decisions, the more influence it has on the general costs of the project and it will cost less to do these changes. For this reasons it is extremely important to do an initial project evaluation even before a sustainability study.